Chloe Frohock will be compiling pictures for this year's banquet slide show. The slide show typically plays while everyone eats at the banquet. If you have pictures from this past year at FFA events or FFA members in ag classes, please e-mail Chloe by 4/29. Send 5 pictures of your life (birth to now) to chloefrohock@yahoo.com. Also, provide the college you will be attending and your degree. These pictures will be featured at the banquet. These items are due 4/29. 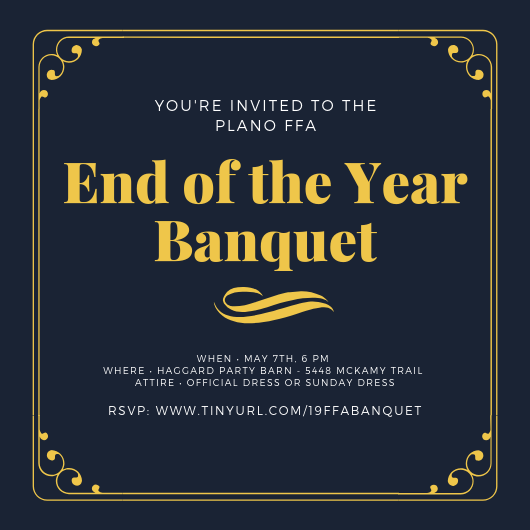 March 28th information was emailed to members about the selection process for 2019-2020 Plano FFA Officer. Please click the link below for more information. Pay special attention to deadlines / dates as these are firm. This week our CDE teams will compete in the Area V CDE Contests. Good luck to our teams & students competing. Top placing teams will advance to state!!! Includes: Pizza & drinks. One hour of bowling & arcades. Payment must be made BEFORE the meeting. Payment options include: PayPal, dropping money off in the Booster Club mailbox at PSHS. At the FFA Banquet we honor our honor working FFA members that have excelled in various categories. Students wishing to be considered for an award, should complete the application below and turn in no later than 4:15 PM Tuesday, April 30th. MAKE A COPY OF THE APPLICATION & SAVE TO YOUR GOOGLE DRIVE - DO NOT WRITE ON THE APPLICATION LINKED BELOW! Students planning to run for FFA officer and current officers are required to attend this meeting. All actively involved FFA members (especially those on a CDE team) are encouraged to attend this meeting. We will vote for the 2019-2020 District 7 officer team & have the district speaking contest. All actively involved FFA members will be recognized for their participation this school year and the 2019-2020 FFA officers will be inducted into office. Parents are strongly encouraged to join their students. Members should wear official dress, if you have it. Applications are available for the special awards that will be given out at the banquet. Current FFA officers, incoming FFA officers, and all actively invovled FFA members should attend the Area V Convention. Hannah Stanley will represent our chapter in the area talent contest, we will elect the 2019-2020 Area V officer team, and see who will be running for Area V Texas FFA Officer. Official dress required. Students will miss the entire day of school. Incoming officers are required to attend the State Convention. All actively involved FFA members are encouraged to attend this fun-filled week! We will travel in a school bus with Plano West & Plano East FFA members, stay in a hotel, tour businesses in Ft Worth, and make friends across the state of Texas!!! The Courtesy Corps is comprised of current FFA members who help with various parts of state convention. These tasks can range from helping at guest registration to helping members find their seats on the arena floor. This experience allows you to see the inner workings of convention that you might miss by just being an attendee. Students and parents interested in purchasing a lamb or goat during the summer for the 2019-2020 school year are encouraged to attend this informational meeting. Below are a list of a few great agriculture learning opportunities for the summer. Plano FFA does not coordinate any of these events. We just want to provide you with a few ways to expand your agriculture education. These opportunities are mostly open to current sophomores and juniors, but each one varies. All members and parents should sign up to receive FFA text messages. If you currently are receiving accommodations for a disability under Section 504 or Special Education and believe you need an accommodation in order to have equal access to participate in tryouts/activity, please let the advisor in charge know as soon as possible, but no later than 24 hours before the tryouts are scheduled.